This Fading LED circuit described here is used to develop a fake alarm. In this, LED's glow slowly, become brighter and again dims slowly. 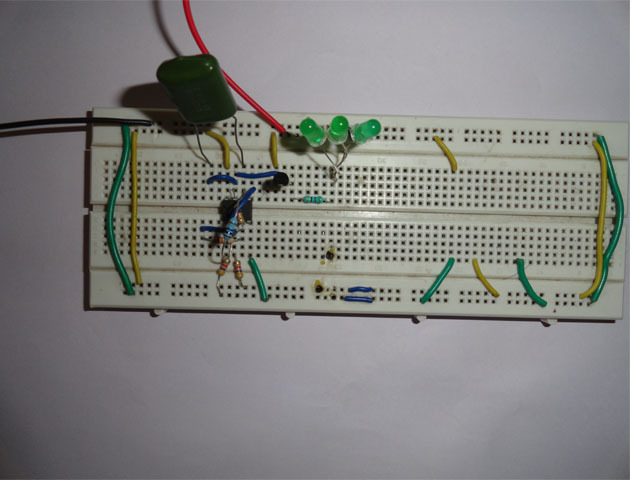 This circuit is based on LM358 IC which is operational amplifier. LM358 consist of two independent high gain operational amplifier in one package. Important feature of this IC is that we don't need independent power supply for working of each comparator for wide range of power supply. LM358 can be used as transducer amplifier, DC gain block etc. LM358 has large dc voltage gain of 100dB. This IC can be operated on wide range of power supply from 3V to 32V for single power supply or from ±1.5V to ±16V for dual power supply. And it also support large output voltage swing. LM358 consist of two independent, High gain operational amplifier in one package. Important feature of this IC is we do not require independent power supply for working of each comparator for wide range of power supply. LM358 can be used as transducer amplifier, DC gain block etc. LM358 has large dc voltage gain of 100dB. This IC can be operated on wide range of power supply from 3V to 32V for single power supply or from ±1.5V to ±16V for dual power supply. And it also support large output voltage swing. The circuit described here uses an opamp to produce a triangle wave, because of this triangular wave LED's glow slowly, get brighter and then slowly become off. Similar cycle is repeated. From the above figure you can see that opamp has two input and one output in one independent LM358. Pin 2 (positive pin) and 3 (negative pin) are the input points. Positive pin is used for positive feedback and negative pin is used for negative feedback. In ideal condition when no feedback is applied gain of the opamp would be infinite. When voltage at pin 2 is more than voltage at pin 3 it will raise the output towards the positive maximum voltage and a slight increase at negative pin compared to positive pin will lower the output towards the negative to maximum. This feature of opamp makes it suitable for the purpose of level detection. The voltage level required for detection can be applied on either of the input pins and the voltage to be detected is applied on the other pin. In our circuit we are applying voltage on positive pin and voltage to be detected is detected on negative pin. When input voltage is applied, positive pin slightly rises above the voltage on negative pin. The output suddenly rises to the positive maximum and remains positive until the input voltage falls below the level to be detected. This is the phenomenon used in the circuit. In this capacitor C1 and Resistor R5 is used as timing components. Capacitor charges and discharges and according to it pin 3 become high and low with reference to pin 2 and we get the desire output. Transistor T1 is used to amplify the signals to drive the LED's and resistor R6 is used as current limiter to protect LED's.